Dubai: Meydan Racecourse hosts the first notable ‘blink and you’ll miss it’ contest in the form of the Listed Garhoud Sprint, sponsored by Al Tayer Motors, the feature race of an interesting seven-race programme. Run over the same distance at the $2.5 million Group 1 Dubai Golden Shaheen, sponsored by Gulf News, the race has attracted a strong field of ten runners headed by Almanaara, an imperious 7 ½-length winner over the course and distance in March. Trained by champion trainer Doug Watson, the exciting son of Shamardal represents Shaikh Hamdan Bin Rashid Al Maktoum, Deputy Ruler of Dubai and Minister of Finance, whose horses have won four of the first five editions of the race since its inauguration in 2013. Almanaara won this race in 2016 and looks the one to beat. Watson also saddles Drafted, a bargain purchase at the 2017 Racing in Dubai Sale, and the promising Kimbear. “All three are in very good shape and working well at home,” the trainer said. “Almanaara has the best draw of the trio over what is probably his ideal trip, but, hopefully, the other two will be staying on. On his third UAE outing, Kimbear chased home the Satish Seemar-trained Raven’s Corner, who set record over 1,400 metres on the Meydan dirt. Trained by Seemar, the five-year-old will be having his first start of the campaign. He is joined in the field by stable companion Circle Dream, the mount of Tadhg O’Shea. 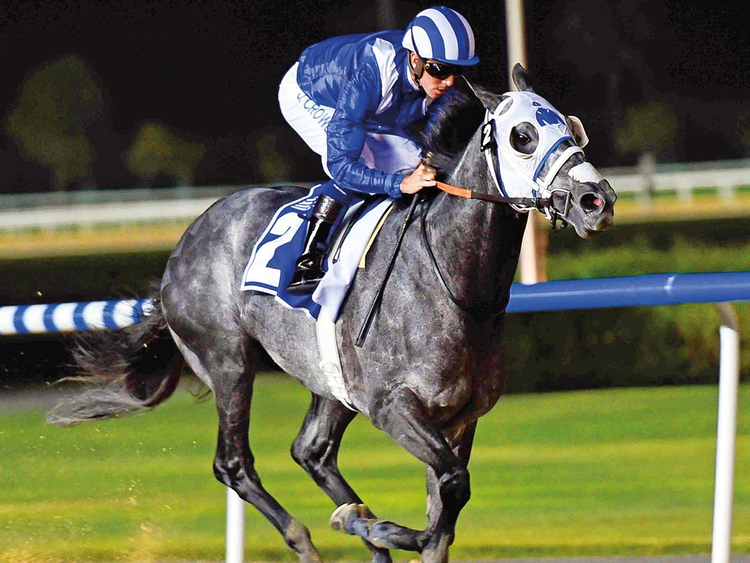 Fazza Stables’ Sandeep Jadhav also runs two, with stable jockey Royston Ffrench opting to partner Jebel Ali Racecourse scorer High on Life and Xavier Ziani aboard Sutter County. Emirati handler Musabbeh Al Mheiri has saddled the winner of this sprint three times and is represented by dirt debutant Ibn Malik, the mount of Ben Curtis. A winner twice in Great Britain when trained by Charlie Hills, he has often run well in the face of a stiff task, having contested races won by the likes of subsequent Group 1 winners Jungle Cat, Ribchester and The Tin Man. Besides the feature, Thursday’s card also features the 1,400-metre Lincoln Continental, and Lincoln Navigator over 2,000 metres. Another race to look forward to is the Lincoln, a 1,600-metre conditions race for which a dozen two-year-olds have been declared. Heading the weights are the two previous winners and thus penalised, Walking Thunder and Superior. Both are trained by Ahmad Bin Harmash for the Phoenix Ladies Syndicate, a new entity who were celebrating victories with both their first ever runners. Stable jockey Connor Beasley, aboard for both the wins, sticks with Walking Thunder, while Antonio Fresu picks up Superior.